On Oct. 20, 2017, just four days after Iraqi forces and the pro-Iran Hash’d Al Shaabi militia captured the oil-rich city of Kirkuk from Kurdish peshmerga troops, fighting broke out along the southernmost peshmerga line, 50 kilometers north of Kirkuk. 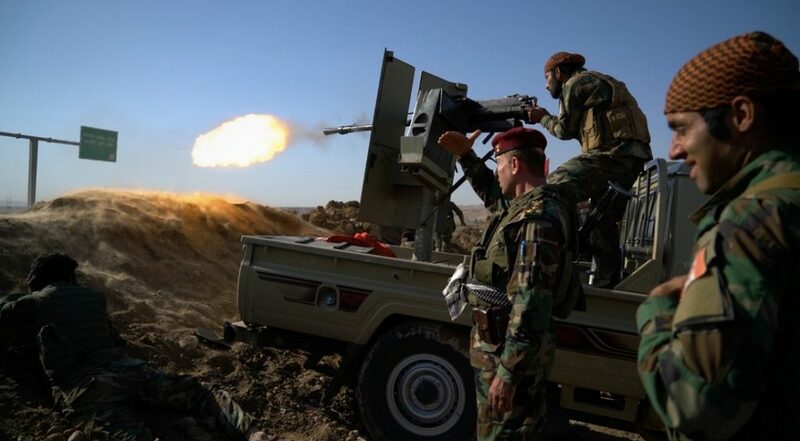 The fighting began at 8:00 in the morning on the Erbil-to-Kirkuk road near the village of Pirde, when Iraqi Special Forces began to mortar Kurdish units. An apparent 81-millimeter mortar exploded not far from a group of Kurdish generals standing outside a command post. Gunfire erupted on both sides. The fighting was fierce. Iraqi forces continued to shell the Kurdish front, ultimately forcing the peshmerga to fall back to the Altun Kompri checkpoint, one kilometer to the north on the Iraq-Kurdistan border. Fighting continued around the checkpoint. Kurdish tanks and artillery bombarded the attacking Iraqi units. Kurdish soldiers toting Panzerfaust anti-tank weapons dug in, awaiting Iraqi vehicles. A bridge divides the two sides. It’s the only way into Kurdish lands from the south. When Iraqi forces made a move to cross, the Peshmerga blew the bridge. There were reports that two Iraqi Humvees had been destroyed. The Kurds cheered and fired their weapons into the air. On Oct. 16, 2017, the Peshmerga had retreated back to pre-2016 lines, after negotiations failed between the government of Iraq and the Kurdish Regional Government. Baghdad demanded that the KRG remove all forces from Kirkuk province and its surrounding oil fields. As Baghdad reclaimed Kirkuk, the peshmerga general command declared the takeover “a clear declaration of war against the people of Kurdistan.” “The peshmerga will bravely defend their people,” the command warned. The pro-Iran Hash’d Al Shaabi, a Popular Mobilization Force brigade, is one of roughly 40 different Iraqi state-sponsored PMFs that have been working closely with Baghdad to liberate areas under Islamic State control. Lately tensions have been escalating between the peshmerga and the Hash’d Al Shaabi. After the Hash’d pushed the Kurds out of Kirkuk, peshmerga special forces struck back, killing Zeriva Abu Yasser, the Iranian general commanding Hash’d Al Shaabi. Kurds also had help from the east. The Iranian Kurdistan Freedom Party supported its Iraqi counterpart. “We are all Kurdish, from one family of Kurdistan,” PAK officer Sdeq Mohammad said. The Iranian PAK, like the Hash’d, originally came to Iraq in 2014 to fight ISIS. As fighting continued late into the afternoon of Oct. 20, there was a huge explosion. 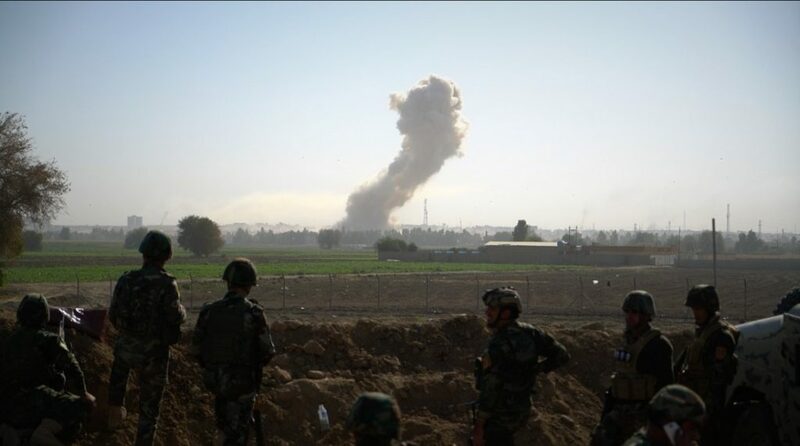 A black tower of smoke rose from the Iraqi-held south. Warplanes could be heard flying overhead. Peshmerga troops rejoiced. But it’s unclear whether the blast really was from an air strike — and whose planes had attacked. The battle was turning into a stalemate. Iraqi prime minister Haider Al Abadi ordered his forces to hold their positions outside the “administrative boundaries of Kirkuk province with Erbil.” Both sides continued to swap gunfire over the static front line.